We supply commercial fixtures from numerous well-respected brands including Bristan, Bauhaus and Armitage Shanks so you know that they are going to be fantastic quality. 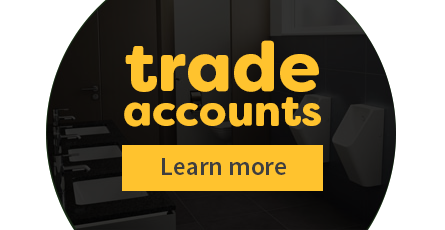 Our varied range of commercial products features everything you need for a complete bathroom including urinals, taps, basins, hand dryers and more. When it comes to planning your business premises one of the most important aspects is to ensure that the bathroom is sufficient for the requirements of everyone in the building. This can often be a little bit trickier than it seems as there are regulations to consider. In this guide we'll explain the key things you need to be aware of when buying commercial bathrooms. You're well covered when it comes to choosing fixtures for a commercial bathroom as we stock a wide range of products. Ideally you'll need to cover all bases, so this includes toilets, urinals, basins, taps, hand dryers, and even showers in some cases. Fittings such as urinals come in various options to suit businesses of various sizes. We supply single urinals as well as banks of 2, 3, 4 or 5 bowls so both large and small premises are covered. Keeping things hygienic is obviously important in a bathroom environment, especially so in a public setting. With this in mind you'll find that our products are all easy to clean and maintain while we also supply a range of items which promote good hygiene such as hands free, motion sensor operated taps and soap dispensers. Commercial bathrooms need to be easily accessible. They must also comply with regulations so keep this in mind when planning your layout. Depending on the amount of employees a company has, you'll need a certain number of toilets to cater for them. This varies slightly for male and female bathrooms so make sure you do your research beforehand. What exactly are Document M bathrooms? Bathrooms in commercial premises should be accessible for people who have disabilities. To meet the standards which are required you can invest in what's known as a 'document M' package. These sets include everything you'll need so you won't have to buy everything separately. They feature a toilet and basin which are easy to use for people in wheelchairs, as well as grab bars and lever handle taps which are easier to use for people with joint problems. You should always try and make your commercial bathroom as safe as possible, as obvious as this may sound. Doing this is quite simple in reality as what you need to do is keep everything well lit and well ventilated at all times.